Unfortunately, the initiators and organisers of all six Cromarty Splash & Dash events are no longer in a position to continue. We created a fantastic event that grew in size and reputation extremely quickly, almost doubling in size year on year! As volunteers with busy lives, organising all the many elements required at an already hectic time of year is just no longer possible. We're sad to see it go but it was great fun while it lasted. If others wish to step up to continue with the event, we wish you well and would be happy to impart our knowledge, paperwork and hardware to help you on your way. However, it should be noted that the Royal Hotel, the crucial 'hub' of the event, is also likely to be unavailable for future events. There will always be a bunch of hardy souls who fling themselves into the Firth on New Year's Day, with or without an organised event, and that's a great tradition that we're sure will live on. 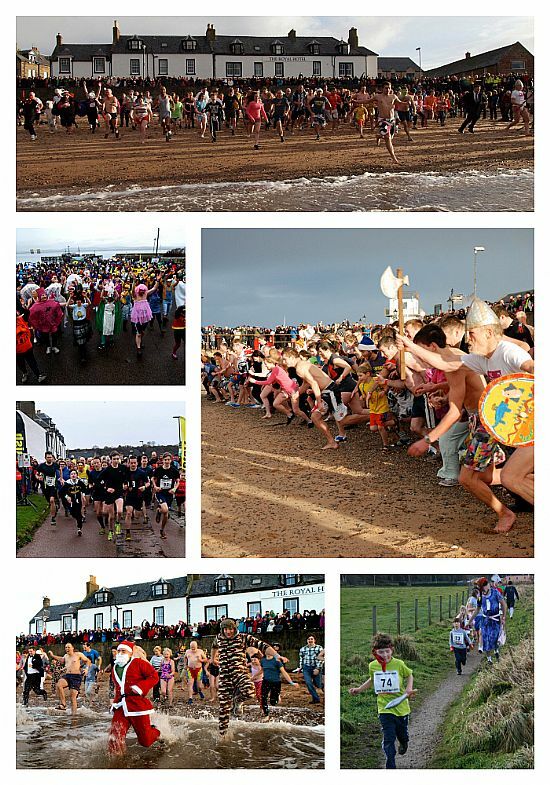 Thanks again to everyone who helped out with, participated in and generally supported the Cromarty Splash & Dash over the years. We have lots of fantastic photos, videos, trophies and great memories to chuckle over for the rest of time. Splash & Dash fans! We still have some souvenir thermal mugs - perfect to keep your brew warm in the winter months and only £5 each! If you would like to buy either of these items, please email georgia@macleod9.plus.com. 2015 videos on YouTube - see what it's all about by watching these great videos of the event on 1st January 2015! There are lots of other great videos from the past six years on YouTube, just search for Cromarty Splash & Dash, sit back and enjoy! FEEDBACK - we're always interested to hear your views on the event. Please use the Feedback Form on this site to let us know of your experiences - whether good or bad - and ideas for improvements/additions, etc.